1. There are more chickens on earth than people – 25 billion. There are also more chickens than any other bird species. 2. Chickens can remember over 100 different faces of people or animals. 3. A mother hen turns her eggs about 50 times per day, and can lay more than 300 eggs per year. 4. The record number of eggs laid by a chicken in one day is 7. The record number for eggs laid by a chicken in one year is 371. 5. An egg develops at 88 degrees Fahrenheit, and is laid at 105 degrees. 6. Chickens were domesticated in Southern China around 8,000 years ago in 6000 B.C. 7. The color of the egg depends on the chickens earlobes. Red ear lobed chickens lay brown eggs, while white ear lobed chickens lay white eggs. 8. As chickens grow older, they lay larger eggs, but fewer than when they’re younger. 9. Chickens can taste saltiness, but not sweetness. 10. In Gainesville, Florida, you have to eat fried chicken with your bare hands. Eating it by any other method is illegal. 11. A hen has to eat about four pounds of feed to make one dozen eggs. 12. The earliest known printing of “Why did the chicken cross the road?” was in 1847 in a New York Magazine. 13. On average, 97 chickens are killed every 0.05 seconds worldwide. 14. By vaccinating chickens, the United Kingdom virtually eliminated salmonella. 15. There’s a rare breed of chicken from Indonesia that is completely black including the feathers, beak, and organs, due to hyperpigmentation. They can be sold for $2,500. 16. There is an invention called a “chicken gun” which is used to test the resistance of airplane windows and engines by blasting dead chickens at the aircraft. 18. In South Korea, there are more fried chicken restaurants than there are McDonald’s restaurants worldwide. 19. 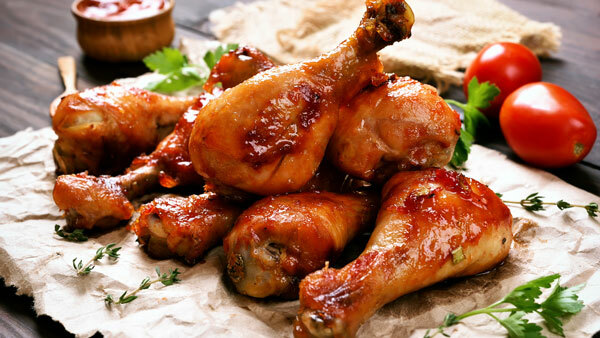 Chicken wings used to be considered undesirable and sometimes thrown out, until 1964 when a restaurant owner barbecued and served them in 1964 and called them Buffalo wings. They were named after the city they were first made in, Buffalo, New York. 20. The record for most egg yolks in one egg is 9 yolks. 21. The largest chicken egg ever recorded weighed 12 ounces and contained two yolks. 22. Americans consume 8 billion chickens per year which is more chicken than beef; at 80 pounds of chicken per capita compared to 63 pounds of beef per capita. 23. When a chicken gets its head cut off, it can run the length of a football field before dropping dead. 24. The longest recorded flight by a chicken lasted for 13 seconds at a total distance of 301 feet. 25. Chickens have prehistoric roots and are the closest living relative of the Tyrannosaurus Rex. 26. Chickens bodies contain 15% more water than humans. 27. The fear of chickens is called Alektorophobia. 28. If the white of an egg is cloudy, it means the egg is fresh. 29. Chickens can see and dream in full color. 30. When chickens feel stressed, they start to lose their feathers. 31. It only takes about 26 hours for a hen to produce an egg, and 21 days for the egg to incubate and hatch. 32. The longest recorded chicken to live was named Matilda, who lived to be 16 years old, which is over twice as long as an average chicken lifespan. 33. Chickens have their own unique language with over 30 different sounds used to communicate. 34. Baby chicks can develop object permanence as soon as 2 days old, while it takes human babies around 7 months. 35. Chickens are omnivores, and a hen will eat their own raw eggs if they are not satisfied with their diet. 36. In order to clean themselves, chickens take dust baths. They dig a small pit in the ground and use the dirt to help with the oil in their feathers. 37. If chickens listen to classical music, they can lay bigger and heavier eggs. 38. Chickens can run up to 9 miles per hour! 39. A chicken’s heart beats from 220 to 360 times per second. 40. Chicken beaks can bleed. 41. Mother hens talk to their chicks while they’re still in the eggs, and the chicks can chirp back while in the shell. 42. In order to attract hens, roosters will do a dance called “tidbitting” involving moving their head up and down, waddling, and making certain sounds. 43. In 2004, the chicken was the first bird to have its genome sequenced – which is finding out the order of their DNA. Doing this helped determine that the chicken is the closest living relative to the Tyrannosaurus Rex. 44. Chickens have three eyelids. 45. Mother hens teach their chicks what to eat and what to avoid. 46. Chicken eggs nutrition value is the same, regardless of the egg color. 47. Most eggs are typically laid in the morning between 7am and 11am. 48. Hens generally choose their mates based on the size and brightness of a roosters comb on top of his head. Sometimes they will mate with multiple roosters at once. 49. Originally, chickens were domesticated for the use of cockfighting. 50. If you trick a hen into thinking a day is 28 hours by using certain lighting, she will lay bigger and stronger eggs.